Motorica has made 3D-printed cable-operated prosthetic hands for more than 150 children, and has now set its sights on creating Russia's first bionic hand for children. Photo: Motorica. Launching a crowdfunding campaign is one of the tasks set by the producers of the show, which is currently being filmed by the NTV channel and is due to air next month. Many of the innovative Russian companies competing for the show’s main prize of 25 million rubles ($422,000) are resident startups of the Skolkovo Foundation. Avrora Robotics, which is raising 100,000 rubles to create Russia’s first entirely robotised farm in the Ryazan region, where “AgroBots” (robotised tractors) developed by Avrora Robotics will plough the earth, plant and harvest a range of crops. The AgroBots have already been successfully tested at closed sites during the last two years. Bonaka (Nanoserv), which aims to raise 100,000 rubles that it will use to clean the heating systems of several children’s homes using its invention: a formula of ecologically friendly modified lacto-acid bacteria that when introduced to pipes, removes all the buildup inside, making pipe transmission almost as efficient as when the pipe was first made, meaning buildings are better heated. DRD Biotech, which is seeking 100,000 rubles to help finance clinical trials of its express test for diagnosing ischemic strokes. 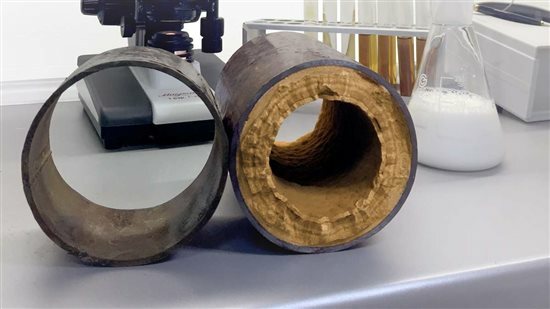 Nanoserv's Bonaka treatment restores pipes to pristine condition without harming the environment. Photo: Bonaka. GetShop.TV, which is raising 100,000 rubles to implement its technology for allowing Smart TV viewers to buy goods they see onscreen using their remote control. Motorica, which is looking to raise 500,000 rubles to create Russia’s first bionic hand for children. Promobot, which is raising 500,000 rubles to enable it to build one of its friendly service robots especially for the League of Robots, a network of robotics schools for children. Promobot believes the schools will produce Russia’s future elite engineers, and wants to donate a Promobot to help the children learn about areas including computer vision, speech recognition and chatbot technology. Zooprotein, which is seeking 100,000 rubles to develop its production of a protein supplement for animals made from dried fly larvae bred on agricultural meat waste. The supplement can be used instead of fishmeal, which requires five tons of commercial fish to produce one ton of it, wasting fish that could be used to feed humans, the company argues. Establishing a crowdfunding scheme was easier for some startups than others, given that they are at different stages and are working on tech products and solutions covering a huge range of fields. For express stroke test maker DRD Biotech, a resident of Skolkovo’s biomed cluster, the task presented something of a dilemma, the company’s marketing director Simon Pokatskiy told Sk.ru. “The basic idea of crowdfunding is that you propose a product, and you’re raising money for that: you use the money to launch the product and then send it to the people who sponsored it,” he said. “Our situation is a bit different as firstly, we need a lot of money to launch our product and secondly, we can’t launch it in a short space of time because we still need to get it officially registered as a medical device,” which can be a very lengthy process, explained Pokatskiy. DRD has a working prototype of its test, but still needs to carry out clinical trials, which will cost the company about 25 million rubles, before it can obtain certification of its product. The company was reluctant to skip the crowdfunding challenge, however, and came up with a variety of ways to entice backers. For 500 rubles, for example, donors can sponsor one elderly patient to undergo testing for the risk of a stroke, a service the company is offering in partnership with Soyuz, a holiday home for elderly people. The DRD team led by CEO Anzhey Zhimbiev (centre) is raising funds to carry out clinical research. Photo: DRD. The company is offering donors the chance to receive the express test once it is certified, but warns them that this process is expected to be complete at the end of 2018. Backers can sign up for quantities ranging from three tests for 1,500 rubles to 100 tests for 50,000 rubles. The latter offer is aimed at doctors and scientists and also includes training in using the tests, which could revolutionise how quickly stroke patients are treated: currently, an MRI is needed to confirm a stroke diagnosis, and while a patient is being transported to a facility with an MRI machine, precious minutes and hours are lost. DRD’s NR2 antibody rapid test diagnoses ischemic strokes from one drop of blood in five minutes, and is designed for use by paramedics and other medical personnel. The company has also developed similar tests to determine the immediate risk of a stroke in elderly people, and to diagnose concussion. DRD launched its crowdfunding campaign on November 2, and one week later had already raised 60,550 rubles: more than half of the 100,000 rubles target, with 40 days still to go. “The most valuable aspect of this campaign for the company is that we can see that there is demand for the product among ordinary people, and not just among neurologists and medical professionals,” said Pokatskiy. If the company exceeds the target amount, which was set by the producers of “An Idea Worth a Million,” the extra funding will all be spent on the clinical trials, he said. DRD also won a Skolkovo grant that partially covers the cost of clinical trials, and is currently looking for an investor to fully cover costs. Avrora Robotics wants to create Russia's first fully robotised farm in the Ryazan region. Video: Avrora Robotics. Motorica, another resident of Skolkovo’s biomed cluster, has set its sights on building a bionic hand for children, having already designed and built cable-operated prosthetic hands (operated by the wearer by moving the wrist joint) for more than 150 children in Russia, Kazakhstan and Belarus, and recently launched its first adult bionic hand. Currently, most Russian children are given cosmetic prostheses that are not functional and do not help the child, and merely attract negative attention, Motorica says. The aim of the startup, whose cable-operated prostheses are brightly coloured and incorporate gadgets to give their young wearers enhanced abilities, turning them into what Motorica describes as “superheroes,” is now to create a multifunctional bionic prosthesis complete with useful gadgets. It expects to have its first prototype by May 2018. Bionic prostheses react to muscle impulses, recognise phantom gestures and transmit signals to the prosthetic hand. Motorica has developed its own myo-sensors that are attached to the wearer’s active muscles and use neural networks to detect and recognise phantom gestures. Options for backers of Motorica’s campaign include a children’s colouring book featuring young superheroes equipped with prosthetic hands for contributions of 1,000 rubles, or a T-shirt featuring a superhero for donations of 2,000 rubles. For 350,000 rubles, Motorica will make an additional bionic hand for a child, which can be for a specific child nominated by the donor. As of November 9, Motorica had raised 47,417 rubles with 40 days still to go. A full list of the companies raising money on Boomstarter as part of their participation in “An Idea Worth a Million” is available here.